Hand sculpted twig band with two sculpted leaves. 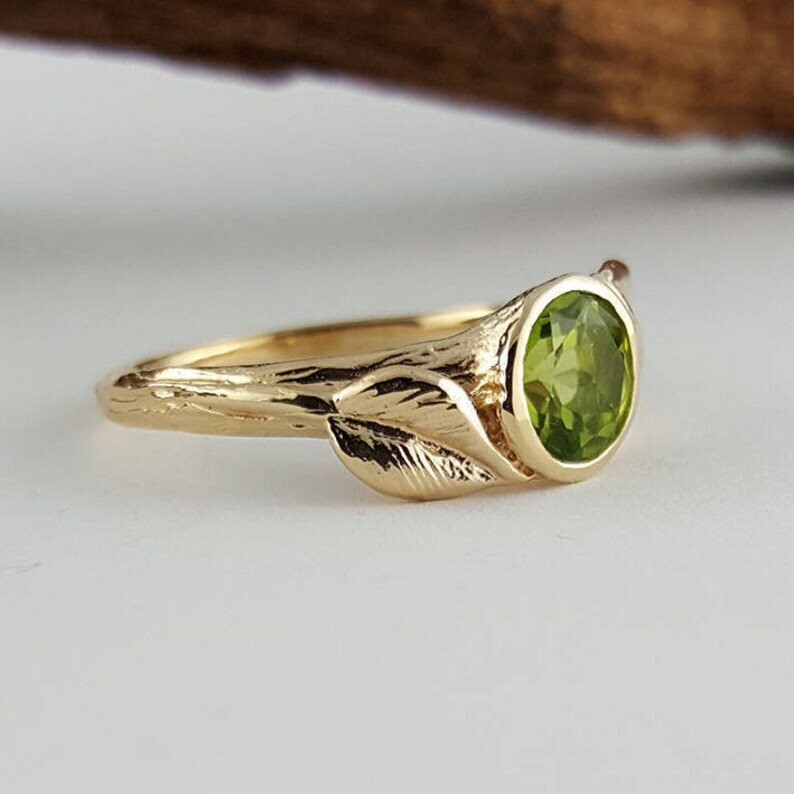 The Gemstone Engagement ring shown is 14k Yellow Gold (YG) with a 6.5mm Green Peridot. All of my rings are hand sculpted by me. All of our rings are cast in recycled, certified "Conflict-Free" Gold. Each Gemstone is Round, 6.5mm Polished and Faceted Gemstones. Recycled Conflict Free Gold available in 14k white, rose, or yellow gold; or 18k yellow or white. ● Your rings come in a single ring box with a black velveteen DV drawstring pouch. Beautiful ring exactly what I wanted completely love it! Worth the wait arrived when promised very so happy! Super pretty, I love it! Being happy with your jewelry is my top priority. I pride myself not only on exceptional jewelry, but the best customer service as well. Please contact me with any questions or concerns as soon as possible after receiving your order. If you are somehow dissatisfied with your order, please contact me as soon as possible. Items may be returned or exchanged with a post date within 7 days of receiving the item. Pieces must be in the same condition as when they were received, and must be in original packaging. Item must be sent via USPS Priority (or other 2 day method with FedEx or UPS) fully insured and with a Delivery Confirmation. Custom orders are judged on a case-by-case basis. They are usually not returnable, but in some instances I can take the return for a restocking fee. Please check with me beforehand. IMPORTANT: Please note: If your Dawn Vertrees Jewelry is worked on by another jeweler or altered by anyone other myself, this will void your warranty. Customer will be responsible for any repair cost. Made-to-order items take 3-4 weeks, plus shipping. Custom Orders: 6-8 weeks, plus shipping. Items in stock, ready to ship: 1-3 days, plus shipping. Resizing a Ring: 7-8 Working Days once purchased. If you have a rush inquiry or would like to discuss a modification to the order, please contact me with your specific request prior to ordering. A rush may be possible, but not with all items. USA - USPS Priority Mail 2-3 Days with Tracking. Note: If you would like another form of shipping, please send me a message. NOTE: We strongly encourage International buyers to check with their postal service first before purchasing items. Their could be additional fees and or duties that are the customer's responsibility. Next Day Express Shipping is available, please message me for a quote. WARRANTY: All Dawn Vertrees Jewelry Designs come with a 1 year warranty, please contact us as soon as there is an issue or repair needed. IMPORTANT: Please note: If your Dawn Vertrees Jewelry is worked on by another jeweler or altered by anyone other than myself, this will void your warranty. Customer will be responsible for any repair cost. MADE-TO-ORDER Items: I'm usually working on several orders at one time, please allow up to 3-4 weeks for these pieces to be made and shipped. COMMISSIONS / CUSTOM Pieces: At this time, all custom orders due to their complexity which take much long to hand sculpt, please allow 6-8 weeks to ship. Thank you so much for your understanding!